This Mini Camera Bag Ki is specially designed for Instax Mini8/8+/9 camera. It contains almost all the accessories that you need. 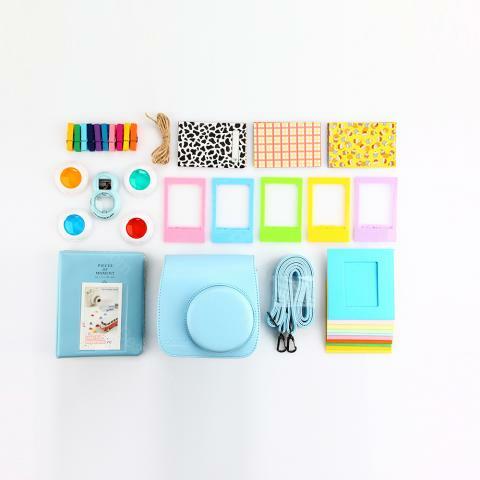 The Instax Mini Camera Bag Kit is specially designed for Instax Mini8/8+/9 camera. It will help you to carry your camera freely and prevent possible scratches. This is the best accessory kit for Instax Mini8/8+/9 Camera. • The bag is for Instax Mini8/8+/9 camera. 생각보다 실용적이구 좋네요~ 마음에 들었어요. 많이 파세요. 최고예요...ㅠㅠ ㅋㅋ 제품상태도 너무 좋고, 유용한것 같아요. 크기도 적당하고 색도 화면보다 맘에 듭니다. 카메라 보호가 잘되여서 좋네요^^* 감사합니다 잘 쓸게요!